On Tuesday, 1/29/2019, I was invited to the radio talk show in Phoenix, Independent Talk 1100 KFNX. The show was live streamed on Facebook, Successful Aging. My name is Ramona. I started practicing Practical Method Tai Chi with Ping Wei approximately one year ago at Paradise Valley Community College. I have always liked martial arts and was curious about Tai Chi. The promise of strength, balance, and brain power intrigued me so I decided to give it a try. After all, what can I lose? After a year of steady practice I have improved, or so my teacher tells me, and he should know. After all he has been practicing for many years. Discounted early registration closes on January 10. A workshop T-shirt will be awarded to people who register early. Ping Wei will teach a private workshop in Las Vegas on December 5, Tuesday from 10am to 5pm. The workshop will be on foundations and Yilu. 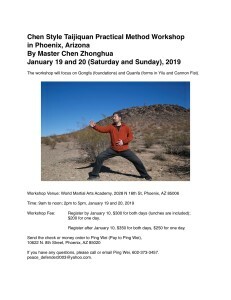 It will prepare people for Master Chen’s workshop in Phoenix in January. Ping Wei will teach a workshop in Irvine California on December 3, Sunday, from 10am to 5pm. The workshop will be on Cannon Fist. 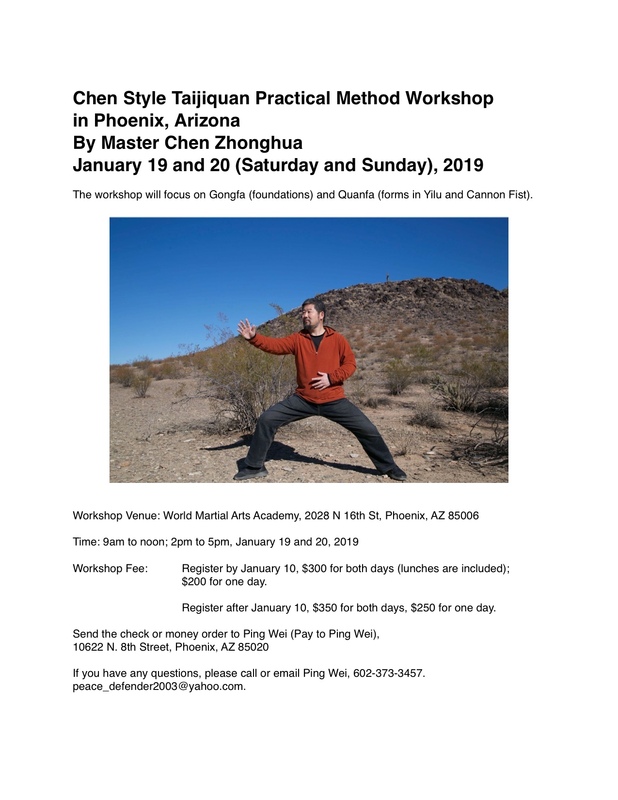 We are excited to announce that Master Chen Zhonghua will return to Phoenix in January 2018 to give Practical Method workshop. The dates, January 20 and 21 (Saturday and Sunday), are confirmed. Save the dates and don’t miss this exciting opportunity. The workshop will focus on Gongfa (foundations) and Quanfa (forms in Yilu and Cannon Fist). Time: 9am to noon; 2pm to 5pm. Register after January 10, $350 for both days, $250 for one day. If you have any questions, please call or email Ping Wei, 602-373-3457. Ping Wei will teach a full day Practical Method workshop in Irvine, California on January 16, 2017 (Monday, MLK Day). Master Chen’s Practical Method workshop and private lessons in Phoenix, Arizona, October 1-4, 2016. *This article was originally published in T’ai Chi, the International Magazine of T’ai Chi Ch’uan, Vol. 29, No.5, October 2005. ISSN 0730-1049, Wayfarer Publications, Los Angeles, CA 90039. The following is my proposal for teaching Tai Chi at Paradise Valley Community College (Phoenix, AZ). It was accepted and the class will be scheduled for the Spring 2017. From Oblique Single Whip (44) to Single Whip (54), plus demonstration of the last two sections from Middle Cloud Hands (55) to Turn Left and Buddha’s Warrior Pounds Mortar (81). Ping Wei will visit Irvine California and teach foundations and Yilu in a one day workshop on March 21, Saturday. This will be his third workshop in Irvine.